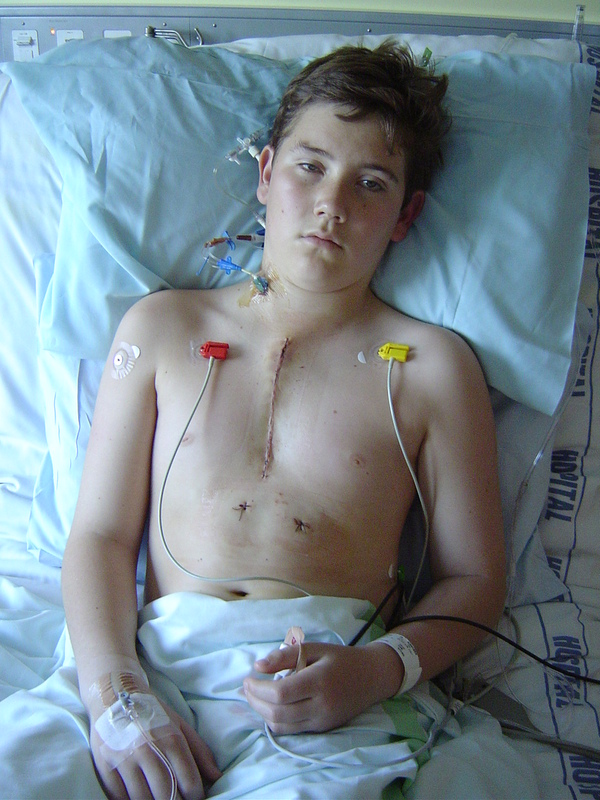 5/10/04 I arrived back at ICU about 6am and Brads breathing tube had been removed. He was awake but very groggy. His only small complaint was of a sore throat but as he had vomited he was not allowed anything to drink. Eventually he was given a lemonade iceblock and if I live to be 100, I don't think I will ever see anyone enjoy an iceblock like that again. lol. This morning was a bit of a blur. As the morning went on his pressure tube was removed, catheter out, and he was visited by the physio. It almost looks cruel to make someone who has been split down the middle, just a day prior, cough, but Brads lungs had to be inflated with deep breaths and the fluid coughed up to avoid infection. This was very painful. The "pain team" arrived and hooked Brad up to a morphine PCI pump. (Patient controled infusion). If he felt pain he pushed a button and this automatically dosed him with morphine. It was set so that he could only make it work after 8 minutes had lapsed and if he gave himself the "allocated hourly dose" it would put him to sleep. Only Brad was allowed to push it. He had another ECG and one tube was taken out of his wrist. The chest and lung drains are very painful to come out. Brad was given a drug that made him hallucinate so he would not remember their removal. He was off the planet!!! It took him a few hours to lose the spaced out look and his mind was quite foggy for a while. It worked though and he has no recollection of it at all. 1.00pm We were moved back to the Heart ward and had another visit from the physio at 2pm. Brad was given a machine to breath into and try and get a marker to rise to a certain level. This hurt him but he diligently did it every 2 hours as the alternative of having to have a drainage tube re-inserted did not appeal to him at all. He was still spacey from the drug, very tired, and slept most of the afternoon. 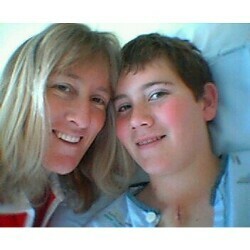 6/10/04 Antibiotics were stopped today. Brad had been feeling sick so the "pain team" visited again and stopped the morphine pump. Changed him to morphine pills and panadol. 9.30am The neck tube was removed. This hurt but is a relief to get it out as it's very uncomfortable. 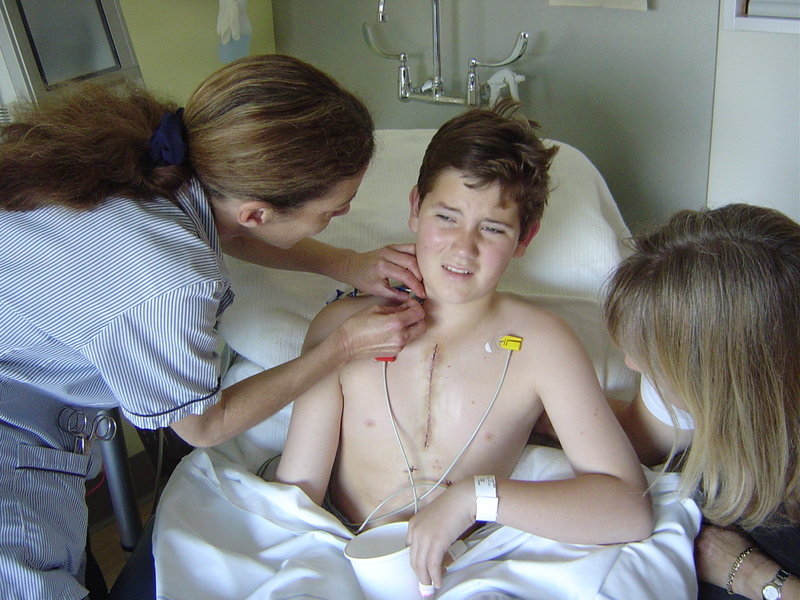 7/10/04 Visit from Tom Gentals, cardiologist who is very happy with progress. If he's happy, I'm happy!! Was told Brad will be on BP pills for about 3-4 months as the heart does not know that it doesn't have to work as hard anymore and needs to be re-trained. Brads aorta was around .7cm wide as opposed to 1.8cm which is normal for his size. Visit also from the hospital school teacher to arrange home school stuff for the month Brad will have off school recovering. He never smiled much at her. lol. 8/10/04 Yet another ECG, Echo and X-ray. BP pills increased. Visit from the physio to say... No trampoline, bike riding, running, swimming, sport for 3 months until the bone has healed. We can go for walks and when the wound has healed, Brad can lounge in a pool, but cannot swim. 9/10/04 Brad looks great. Amazing how quickly he has recovered after such a big operation. We are told we can go home and rest. Another round of Blood pressures and we are "out of there". The 2.5 hour ride home was not very comfortable for Brad and we did stop a couple of times. But sooooooooo good to be back home where the beautiful Gordon, greeted us with a purr the sound of a truck engine. 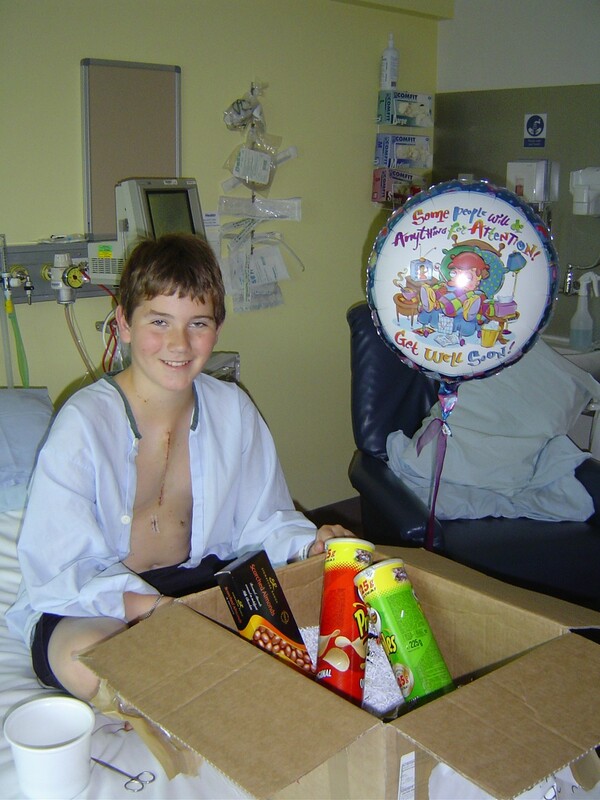 19/10/04 Brad is doing extremely well. We started on a small fitness programme on Monday and the Hospital school teacher has been for a visit and left a pile of work. Brads scar is healing nicely and he has not had any pain relief after the first day home. It is finally sinking in to us that we will have him with us for many many more years than the short time we had initially been told. After January, Brad will be able to start back at his rock climbing and any other sport he decides to choose. He starts college next year and all of this will be well and truly behind us. What a year!! 8/11/04 Brad went back to school today for a week of half days. All the kids in his class gave him a big clap as he walked in, no prompting from the teacher, they just did it!!! It was really neat. 15/11/04 Back at school full time as of today. Brad is not allowed to do P.E. but this is mainly because the sternum has to heal after being split down the middle. He is pleased to get back to a normal routine and to be back with all his friends. I asked Brad the other day if he felt and different after this operation.. After all these years of him always getting "puffed" which was just part of his life and he never know any different, he said " I notice I don't get puffed anymore when I walk up the staris". A small comment that has such a big meaning to us. I feel that Brad "looks" more alert and am really looking forward to next year when he is able to get back into physical activity, to see the huge improvement in his ability to cope. Roll on 2005!! 2/2/05 Brad started Otumoetai College Today. What a mile stone!!! He is now pretty much free to do what he likes. He has had a personal trainer come to our house twice a week for a few weeks to build up strength and fitness. He will start rock climbing again next week and will be able to enjoy any other sport he desires. 9/2/05 Last day of medication today!!! Brad has been given the OK to stop his medication as his Blood Pressure has stabilised. He will have weekly checks for a while, just to be sure it's all going to plan, but things are looking good. To date, Brads heart has reduced in size by 5mm. Woo Hoo !!! !